I heard the sound of a flute. The flutist played a light and airy tune, making me think of manicured forests wherein a boisterous Pan might dance and revel. I looked around, trying to locate the source. To my left, somewhere. 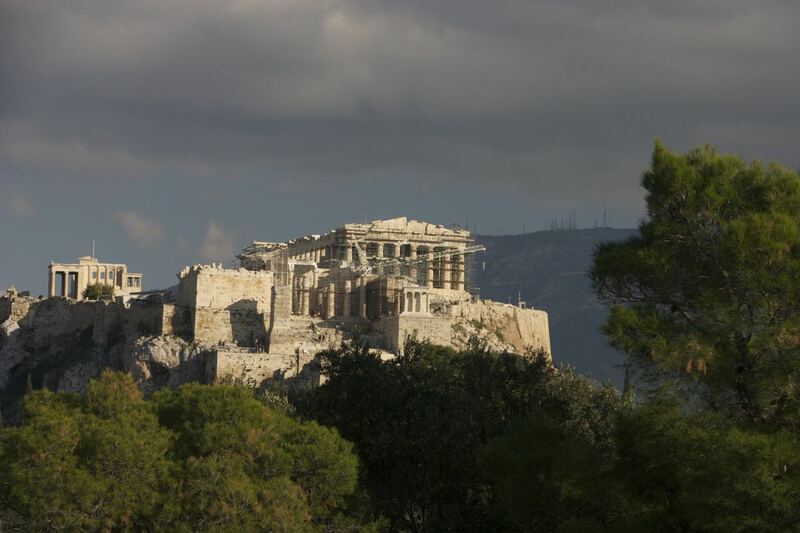 As it was my first day in Athens, my goal was to find my way up to the Acropolis. That twenty-five-hundred-year-old citadel with its pillars and statues and steps was still the centerpiece of the city. No longer did the great citizens go to the Parthenon to give honor to the goddess Athena, but the hill the Acropolis stood on served as a pilgrimage site for who-knew-how-many tourists and travelers each year. But I had neither map nor guide and my Greek was nonexistent, so I wandered the maze of streets below the cliffs, trying to find the one that would lead me out onto slopes where I might be able to eventually make my way to the ‘official’ path. In Athens, though, it seems there aren’t very many straight roads. The ones I chose circled the great hill, every path up dead-ending at walls or more roads running in the wrong directions — until at last I found myself on a wide pedestrian street paved with chunks of pale, smooth stone. To my left was an irregular outcropping of rock that rose out of trees and scrub, beyond that was the Acropolis — closer, but still farther away than I had been hoping. The flute began to play just as I was about to turn back and settle for having a cup of hot chocolate in the warmth of a patio heater at one of the outdoor restaurants I had passed, because the waning afternoon was turning chill. The sound came from the outcropping. I followed it, letting the light tune draw me up winding paths until I could see the piper perched upon a stone. He was a round-faced fellow with a grey stubble of beard and a thinning hairline, and he smiled as he played. So it was that on my first day in Athens I watched the sunset from the top of Mars Hill while a flute warbled out a strain fit for an enchanted glade. Looking out over Athens from Mars Hill at sunset. Over the next several days, music came to define Athens for me. There was the flute at Mars Hill, of course. There was also the drum circle near the Thissio metro stop, near the ruins of the Agora, Athens’ ancient downtown. Before I saw the drummers — gypsies and street youth pounding with palms on hide-covered drums — I heard the beat thudding across the lamp-lit streets, mingling with the smell of sizzling foods, the blacks and somber winter clothing colors of tourists and locals, the laughter from within restaurants and bars. To the trails I hiked on the side of Philosopher’s Hill came the notes of a saxophonist; there were the plucked strings of a mandolin heard in the distance as I sat and watched rays from a sinking sun strike the high pillars of the Parthenon from a perch on the Hill of Nymphs; and someone sang a cappella as I walked past chambers carved out of cliffs which had once been homes or crypts or both. 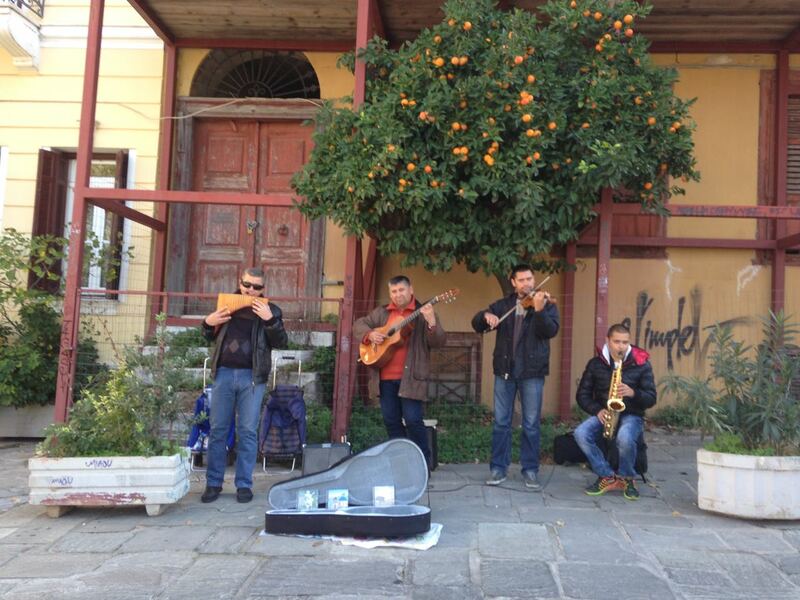 It seemed that everywhere I went in Athens, there was music nearby. Bells rang out from the cupolas of Greek Orthodox churches. A girl and her boyfriend performed rock and roll hits from the 70s on a street just up from the Acropolis Museum. Two locals played traditional Greek music on guitar and mandolin from the stage while I ate mousaka in a stone-walled restaurant in the Plaka district. Two guys with a generator and a couple of speakers wailed out tunes among the necklaces, carvings, paintings, and other street vender fare on a pedestrian walk. Musicians near the Agora in Athens, Greece. And more: A dirty-faced young boy wearing unlaced tennis shoes played an accordion for euros on top of Mars Hill. A trio bearing a bass, a fiddle, and an upturned hat played for the same between metro stops on the inner city rail. Another accordion made its appearance in the hands of a gypsy woman on a separate metro line; a tiny girl followed her, hand clinging to skirt. Music everywhere, and when there wasn’t, there was birdsong. Even at the beginning of winter, even in the heart of Athens. When the flute began to sing, so to did the birds. 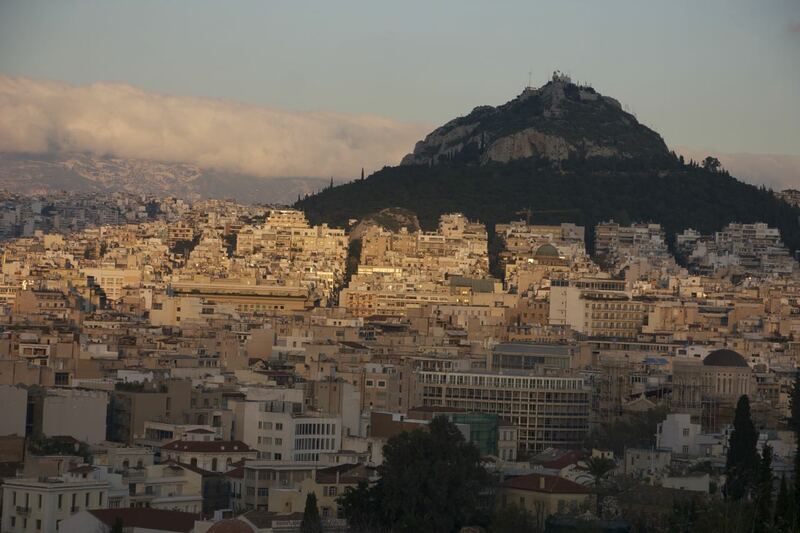 This entry was posted in Observation Deck and tagged Athens, Greece, music, street music, travel. Bookmark the permalink.